Hi, found your blog through Nick Russell. My question is related to the topic but not the same. I could not find an email address so will use the comments. We have a 14 yr old MH with a tag axle. We have owned it for 5 years. It uses LT235/85R16 tires. The rear duals are 5 yr old Cooper tires. I recently lost the right outside dual, it showed a wear pattern of being over inflated, but I know it was not because I check them ... the other 3 are showing a similar pattern. The tires have roughly 20K on them. I had not rotated them. Any idea why this would happen? The tire I lost was checked in morning and holding pressure so it could have been a road hazard. Sorry bout the email thing. I'm new to blogging. Without seeing the tire its really difficult to diagnose. From your comments I assume you do not have a Tire Pressure Monitor System. I would strongly urge you to have the tires inspected by a Cooper dealer. After hearing what they have to say you can decide what to do. I would also suggest you do some Internet research before visiting the Cooper dealer so you know what brand you want to go with if you decide to replace the old tires. I also suggest you read my post on TPMS and consider getting a system. You can always transfer the TPMS system to a newer coach if/when you update your RV. You say your have driven on your tires 5 years. Do you know how to read the date code? I will be posting a blog on tire age and how to read the code soon if you are unsure. Thank you for the reply. Yes, I understand the date codes. The MH is not with me now but the tires are same year, 5yrs old by date code. I forgot to mention that the road tech who changed the tire, said that "Cheap Tires" will sometimes not lay flat. I have never heard that before, is it logical? Cooper may have had some problems with the tires because they have discountined the sytle or name they go by. I am going to replace the tires, and watch the Coopers that I have on the front and tag (which are less than 2 yrs) old more closely. Would a veteran RV'r need to retighten his chock after the tires cool down in order that the rv not roll forwartd or back because the tire shrank? I don't think you will see a meaningful difference in tire OD due to normal cooling after you place your tire chocks. Bill. I would trust the digital hand held gauge. 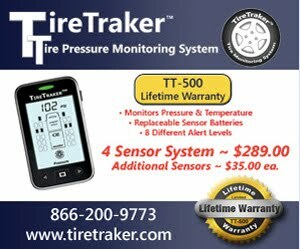 The TPMS is a warning system and is not intended to be used to check the absolute tire inflation. +/- 2 or 3 psi on the TPMS is not a big issue. Use your gage to set the tire inflation then look at the TPMS readout and just remember the approxiamte difference.